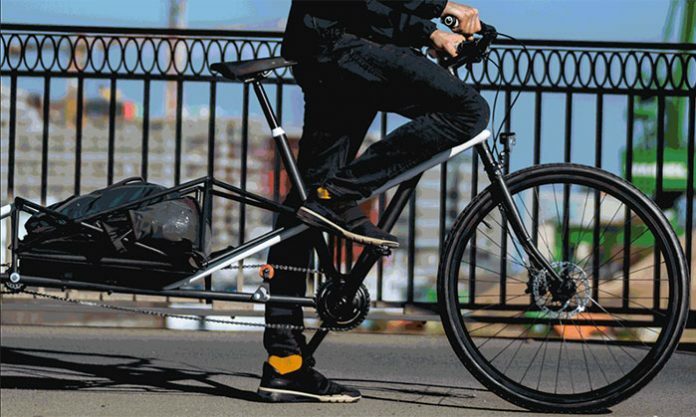 The Convercycle bike is a city bike and cargo bike in one. Loads can be easily and spontaneously transported. We’ve always wished our bikes could do more; whether it’s helping us with groceries or carrying a child. Flip Convercycle is the first convertible electric bike that satisfies this craving for more without losing the feel of a regular bike. It seamlessly combines the features of an electric city bike and a cargo bike, essentially giving you the best of both worlds. Congestion and pollution are major threats to the quality of life of city dwellers. Bikes are among the most popular mobility solutions that facilitate the movement of people from one place to another. Bikes occupy much less space and are more environmentally friendly. However, regular bikes fail to cater for the movement of bigger objects such as grocery bags and parcels. Cargo bikes attempt to solve the problem but they could prove difficult to maneuver and park. The foldability of Flip ensures it doesn’t take any more space than a common bike. This poses an obvious advantage when it comes to parking. Regular cargo bikes cannot fit into usual bike racks due to the extra space they occupy when parked. Consequently, the rider has to look for extra space to park the bike. There is no such problem when riding the Flip Convercycle due to its unique design. Asides the arguably more pleasing aesthetics, Flip doesn’t look any different from a regular bike in its folded position. It boasts impressive compactness and a sturdy look that assures you that you’re getting a durable bike. However, an obvious distinction is noticed once the bike is ’flipped’. Simply lifting the bike around the rear wheel spontaneously turns the Flip into a cargo bike. The space created could prove useful for routine shopping, sports equipment, and even child seats. Flip comes with a patented folding mechanism that is uniquely designed for safety and comfort. When folding, the rear wheel moves into position and the auxiliary chain on the rear aligns with the main chain. The rear wheel is interlocked in its new position and the rider is able to enjoy the safe and smooth riding experience you would expect from a regular bike. Comfortable handle and seat: the Flip’s handlebar, grip, and seat are designed with careful attention to ergonomics. They afford a pleasant ride that is free of any soreness or joint pain. Big basket: the basket is big enough to accommodate two big crates of water. The positioning and design also ensure the balance of the bike is not compromised. Custom made to suit the riders: Flip can come with different saddle rails bicycle stem sizes. You have the luxury of choosing your size before your bike is delivered. Removable battery: The battery can be removed and charged without hassle. The Convercycle Bike “standard” was priced at €1099 EUR while the Convercycle eBike “electric” cost €1399 EUR. The project is already past the crowdfunding stage and the campaign was hugely successful. Hopefully, the company would start accepting pre-orders again soon for those who were not able to support the project during the crowdfunding campaign.